Can emergency medical services personnel identify pneumothorax on focused ultrasound examinations? 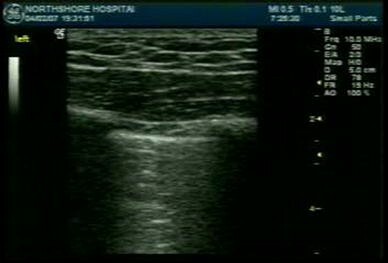 Ultrasound is of proven accuracy in the diagnosis of pneumothorax. In certain locations, pre-hospital providers are adopting its use for the management of critically ill patients. To determine the sensitivity and specificity of emergency medical service (EMS) providers in identifying pneumothorax on ultrasound examinations. This was an educational study evaluating 33 EMS providers. Each subject went through a brief didactic session covering the use of ultrasound in diagnosis of pneumothorax. They were then given an examination consisting of 20 individual ultrasound real-time video cases depicting either a pneumothorax or normal lung sliding. Sensitivities and specificities with 95% confidence intervals (95% CIs) were calculated for recognition of pneumothorax. The 33 study participants were able to identify pneumothorax with a sensitivity of 82% (95% CI 77–86%), specificity of 94% (95% CI 90–96%), positive predictive value of 93% (95% CI 89–95%), and negative predictive value of 84% (95% CI 80–87%). Emergency medical service providers were able to identify pneumothorax at a relatively high rate. Real-time scanning by the study subjects might lead to even better results. Timely recognition of pneumothorax can result in prevention of the significant morbidity and mortality that is associated with respiratory compromise and hemodynamic instability in the case of tension pneumothorax. In a recent large retrospective study, de Moya  found a 6% incidence of pneumothorax in greater than 21,000 trauma patients. In the hospital setting, pneumothoraces are often diagnosed with X-ray and/or computed tomography (CT) scans of the thorax. The luxury of having these imaging modalities available is not afforded to those in the pre-hospital environment, where secondary and primary spontaneous pneumothoraces are missed in 39.4 and 29.4% of patients, respectively . In patients who require on-the-scene airway control, an otherwise clinically insignificant pneumothorax may be converted to tension pneumothorax when positive-pressure ventilation is initiated. Conversely, there is also potential morbidity associated with pre-hospital needle decompression of those patients falsely suspected of having a collapsed lung. Internationally, physicians or allied health personnel working in underserved areas also may not always be afforded the luxury of having expensive diagnostic tools available to them. Over the past decade, ultrasound technology has drastically improved. Newer units are often smaller, lightweight, easy to use and offer outstanding imaging capabilities. The price of these ultrasound systems has also decreased. This may allow the medical team to bring “point-of-care” ultrasound to many patients who otherwise would not have advanced imaging available to them. Point-of-care ultrasound is now a rapidly growing field across the globe. 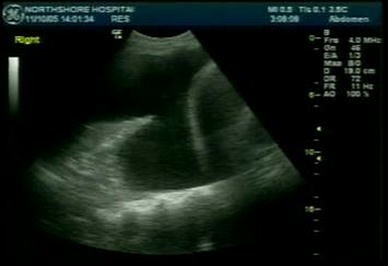 Many studies have demonstrated the utility of ultrasonography in diagnosing pneumothorax . When focused diagnostic ultrasound examinations are performed on trauma patients in the hospital environment, they reduce cost and time to diagnosis . Thoracic ultrasound evaluation adds mere seconds to the standard Focused Assessment with Sonography for Trauma (FAST) evaluation. Body habitus should not interfere with the ultrasound evaluation of the thorax in virtually any patient (when evaluating for pneumothorax) . There are situations involving critical patients where thoracic ultrasound to evaluate for pneumothorax can be useful in the hospital, but the potential benefit of ultrasound is even greater outside of institutions where alternative diagnostic imaging modalities are not available . In military operations, pre-hospital emergency medical services, or space stations where resources are limited, hand-held ultrasound as a portable imaging device has tremendous potential to aid in the timely diagnosis of various conditions. A growing body of literature has demonstrated the utility of ultrasound in such settings . In recent years, there has also been a surge in bringing ultrasound technology to many countries with underdeveloped medical services, or countries with limited resources to purchase more expensive CT or MRI equipment. Furthermore, appropriate training for specific focused examinations to non-physician users may be achieved in a relatively short time period . In this study, we attempt to determine whether emergency medical service (EMS) providers can be taught to identify pneumothorax on focused ultrasound examinations. This was a prospective observational study approved by the institutional review board. The study was performed for educational purposes at a suburban Level 1 regional trauma center with an annual census of approximately 68,000 patients per year. The emergency department has its own affiliated EMS ambulance system. The study participants were 33 EMS providers, all with no previous ultrasound experience and varying levels of EMS experience. Each participant was given a brief 10-min lecture covering the use of ultrasound in detecting pneumothorax. Pneumothorax was identified by the lack of sliding between the visceral and parietal pleural layers (visualized as hyperechoic lines) with no distal reverberation artifact. Normal lung was defined as the presence of sliding with reverberation distal to the pleural line (Fig. 1). The lecture discussed basic principles of ultrasound physics, scanning techniques, and demonstrated video clips depicting both normal lung sliding and pneumothorax. Each participant was then given an identical examination consisting of 20 video clips (10 positive for pneumothorax, 10 negative) and was asked if a pneumothorax was present in each individual clip. All video clips of pneumothoraces were recorded via DVD from actual patients who presented to the emergency department during the previous year. All patient identifiers were removed from the video prior to the initiation of the testing. Pneumothorax was confirmed in these patients by standard chest X-ray or chest CT. The control or “normal” video clips were obtained by imaging healthy volunteers (authors). A high-frequency linear array transducer was used for each examination on either a SonoSite MicroMaxx (Bothell, WA), GE LOGIQ P5 (Milwaukee, WI), or Zonare Ultra System (Mountain View, CA). At our institution, physicians are taught to scan the lungs using this probe type due to the detailed resolution it offers. Others have preferentially selected other transducers in the evaluation for pneumothorax; however, we feel that at this time point the linear array probe is available on most ultrasound systems purchased by emergency departments, can be accessed in a rapid manner on most systems that have multiple active ports, and should yield the best results for this particular focused examination. The study participants were instructed to use the presence or absence of lung sliding and reverberation artifact as the sole criteria for the diagnosis of pneumothorax. No other advanced techniques were depicted in the video clips (such as M-mode, powerslide sign, identification of lung point). Answers were recorded by each participant simply as “yes” or “no”. Data were collected on standardized answer sheets and later pooled for analysis. We used standard 2 × 2 tables to measure sensitivity, specificity, positive predictive value, and negative predictive value with corresponding confidence intervals (CIs). Ultrasound may prove to be a useful diagnostic tool for EMS personnel in diagnosing pneumothorax. With little ultrasound education, EMS providers were able to identify pneumothorax on ultrasound with a high degree of certainty. We chose to focus on the diagnosis of pneumothorax for several reasons. First, it is one of the easiest ultrasound examinations to perform. In a trauma situation, simply placing the transducer in the second to fourth intercostal space in the midclavicular line with the marker directed cephalad will yield imaging adequate to detect pneumothorax with the highest sensitivity. As sonographers become experienced in performing thoracic ultrasound, they will then learn to recognize other pathologic findings such as hemothorax (Fig. 2). Limited technical skills are necessary to obtain adequate images. More importantly, pneumothorax is a life-threatening diagnosis and the ability for EMS personnel to rapidly identify affected patients could drastically improve morbidity and mortality. A prospective study where EMS providers perform the scans themselves may yield better results. Study participants will be able to better decipher probe and patient movement from the presence of lung sliding. Anecdotally, we found the questions that were interpreted incorrectly as “normal” revealed video where the scanner’s hand appeared to be moving slightly or the patient’s chest wall had a lot of movement. This caused the EMS personnel difficulty in focusing the pleural line. Ideally, when performing these examinations, the sonographer’s hand should be completely motionless unless moving between rib spaces. This skill may prove useful in rural settings, for triage purposes to trauma centers, in mass casualty situations and possibly for military use. In rural areas, where medical centers specializing in the management of trauma patients may be scarce, ultrasound used as a triage tool can be lifesaving . In countries all over the world with emergency medical care delivery systems that are not fully developed, EMS providers capable of detecting or excluding pneumothorax with ultrasound can help to avoid unnecessary interventions as well as expedite treatment and transportation of the patient to the appropriate higher level of care. This single application is only one of many that can be utilized by medical personnel globally to deliver high quality medical care in a cost-effective manner. This was an educational study that did not evaluate the use of ultrasound prospectively in the actual practice of EMS providers. The examination given to the participants assessed only image interpretation, and not technical skill, the ability to obtain those images in actual patients, and the ability to incorporate findings into practice. This was simply the first step to see if this group was able to conceptualize images into clinical answers. Our results clearly demonstrate that further training for EMS providers should be pursued to enable them to use ultrasound to improve the care they are able to deliver to critically ill patients.